A rigid body experiencing a state of general motion in three-dimensions is shown below. 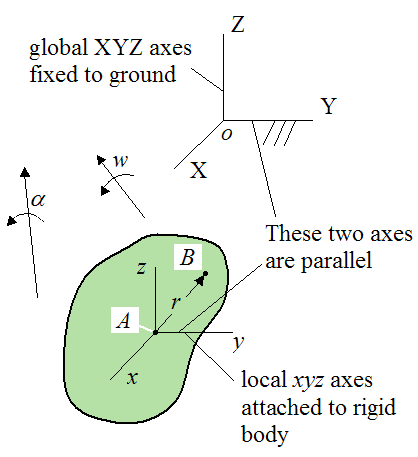 Both coordinate systems XYZ and xyz are defined as parallel to each other. This is done so that vector components relative to each coordinate system can be directly added together (since x is parallel to X, y is parallel to Y, and z is parallel to Z). The first coordinate system is the global XYZ reference frame. This reference frame is defined as fixed to the ground. The point o is the origin of XYZ. The second coordinate system is the local xyz reference frame. This reference frame is defined as attached to the rigid body and moving with it. The origin of this reference frame is located at point A. For both coordinate systems the individual axes shown correspond to the positive directions of those axes. For example, the positive direction of the Y-axes is to the right. The positive direction of the Z-axes is up. The choice of positive direction for these two coordinate systems is defined in this way because the equations that will be presented here involve vector cross-product multiplication, the mathematics of which is based on this choice of sign convention. So it is important to use the same sign convention when solving problems using the equations presented here. If you use another sign convention, you might get the wrong answer. We wish to find the general motion equations for velocity and acceleration of point B, relative to the fixed (ground) reference frame XYZ. Note that point B is not necessarily moving with the rigid body. In other words, point B could be changing position relative to the rigid body. The figure below illustrates this. 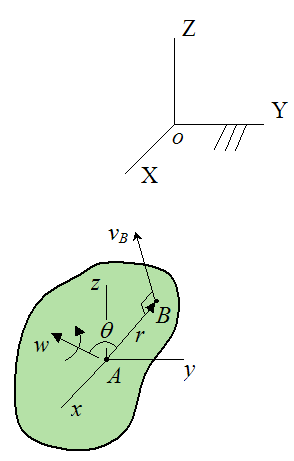 vrel is the velocity of point B relative to the moving xyz axes. Imagine if an observer were sitting on the xyz axes. The velocity vrel is what he would measure. arel is the acceleration of point B relative to the moving xyz axes. Imagine if an observer were sitting on the xyz axes. The acceleration arel is what he would measure. To find the general motion equation for the velocity of point B with respect to ground, it is useful to first imagine a simple case where point A is a stationary point (with zero velocity), and point B is attached to the rigid body and moving with it (vrel = 0). The figure below shows the velocity of point B (vB). At the instant shown, the rigid body is rotating with an angular velocity w, and r is the position vector from point A to point B. The velocity vB is perpendicular to the angular velocity vector w and the position vector r. The magnitude of vB is equal to |w|.|r|sinθ, where |w| is the magnitude of the angular velocity, |r| is the magnitude of the position vector, and θ is the angle between the two vectors w and r, as shown. This is the most general equation for velocity of a point B (with respect to ground), on a rigid body that is translating and rotating. 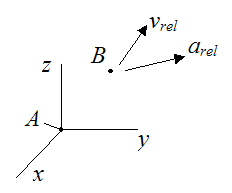 where arel,x, arel,y, arel,z are the components of the vector arel relative to the local xyz axes. 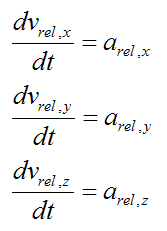 The above formulation is a result of vector differentiation. For more information about this see the page on vector derivatives. This is the most general equation for acceleration of a point B (with respect to ground), on a rigid body that is translating and rotating. For an overview of the general motion equations click here. To see an example of a problem solved using the general motion equations click here. If you know the direction of spin of the angular velocity, you must use the right-hand rule to assign the correct direction for its corresponding vector, and thus determine the correct values for its three components (wx, wy, wz). Similarly, if you know the direction of spin of the angular acceleration, you must use the right-hand rule to assign the correct direction for its corresponding vector, and thus determine the correct values for its three components (αx, αy, αz). 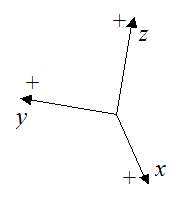 The right-hand rule is consistent with vector cross-product multiplication, and is therefore consistent with the choice of sign convention given here for the XYZ and xyz coordinate systems. This again stresses the importance of using the sign convention used here when solving problems using these equations. This sign convention is standard in physics books. As mentioned before, equations (1) and (6) (for velocity and acceleration) are based on the sign convention used here (i.e. that is how they are derived). An example of a sign convention that does not match the one used here is shown below. This choice of sign convention may result in errors if one uses it to solve problems using equations (1) and (6).